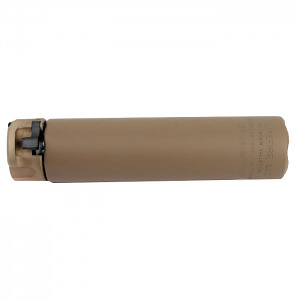 The Surefire SOCOM556-RC2 Fast-Attach suppressor is one of the most advanced 5.56mm suppressors ever made. Compact and lightweight, the RC2 was selected for use in the MK18 and M4 carbine by USSOCOM after the most extensive and rigorous suppressor evaluation in history. It has also received the USSOCOM official safety verification in support of fielding. Constructed of advanced high-temperature alloys and stainless steel, the SOCOM556-RC2 features a more advanced internal venting to reduce back pressure, reducing the suppressed cyclic rate and gas blowback on the user. The new design also includes an integrated blast shield in the back section that increases durability. The patent-pending front-plate design along with proprietary improvement in gas flow dynamics nearly eliminates first-round flash and attenuates noise and dust signatures to an unprecedented degree. Securely mounts to a SureFire muzzle brake or flash hider via the patented Fast-Attach design which attaches and removes in seconds.